I have never been to Russia and know nothing about Russian Easter traditions. I never tasted a Russian Easter bread called kulich but learn something about this bread from Google, Wikipedia and Epicurious. Accordingly to Wikipedia and Epicurious, kulich is a cross between brioche and challah and often baked as a tall loaf in a coffee can. 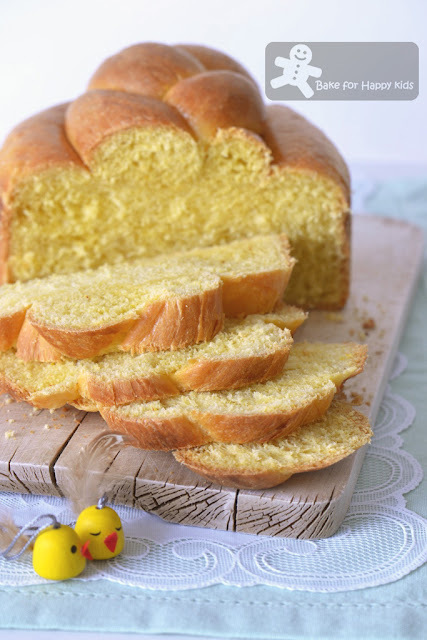 Being lightly sweetened and egg-glazed, kulich would sit proudly in the center of the family basket, decorated with flowers and served with meats, cheeses, butter, and eggs for traditional Eastern European Easter celebrations. I need to do this for a nice glaze. Very soft and delicious.. Yum! My family and I will be away for a really really short break at this Easter long weekend and I will be back to blog again on 3rd April 13. - Happy Easter! Heat milk, sugar, butter, saffron, and salt in a 1-quart heavy saucepan over moderate heat, stirring occasionally, until butter is melted and sugar is dissolved, about 2 mins. Remove from heat and cool to lukewarm. Meanwhile, stir together yeast, warm water, and pinch of sugar and let stand until foamy, about 5 mins. Put flour in a large bowl and make a large well in center. Lightly beat 3 eggs and add to well along with milk and yeast mixtures. 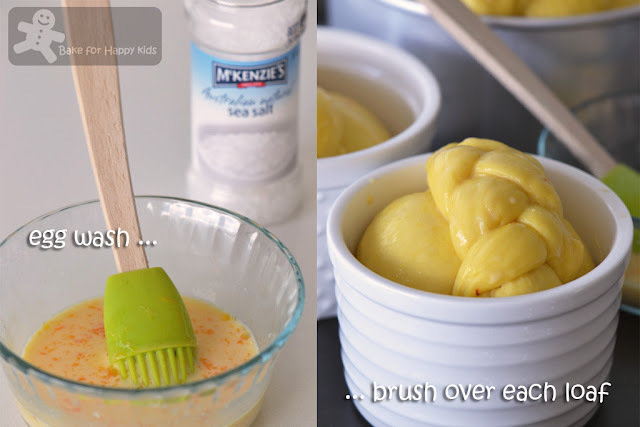 Carefully stir together with a wooden spoon, gradually incorporating flour, until a soft dough forms. Transfer dough to a lightly floured surface and knead, dusting with just enough flour to keep dough from sticking, until smooth and elastic, about 10 mins. Put dough in a lightly oiled large bowl, turning to coat with oil, and let rise, covered with a clean kitchen towel, in a draft-free place at warm room temperature until doubled in bulk, about 3 hrs. Punch down dough and let rise again, covered with towel, until doubled in bulk, about 1 hr. Combine boiling water, butter and salt together in a microwave-safe bowl. Mix well until butter is melted and well incorporated. Place saffron into the mixture and heat it in a microwave with low power for about 2 mins for saffron to release its reddish golden colour. Remove and allow mixture to cool to lukewarm. Place saffron mixture, eggs, flour, milk powder and yeast into my bread-maker and use "dough" setting to knead and prove the dough for 1 hr. 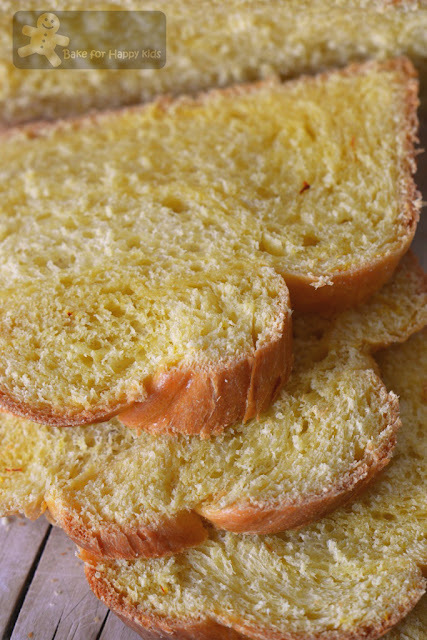 This recipe makes two loaves with each 5-6 cup or 2-pounds capacity. Generously butter soufflé dishes (or any baking pans that you want to use). Punch down dough and divide in half. Loosely wrap 1 piece in plastic wrap and set aside. Cut away one third of remaining piece of dough and reserve, then roll remaining two thirds into a large ball and transfer to a soufflé dish. Cover loaves with clean kitchen towel and let rise in draft-free place at warm room temperature until doubled in bulk, about 1 1/2 hrs (loaves will rise about 1 inch above rims of dishes). 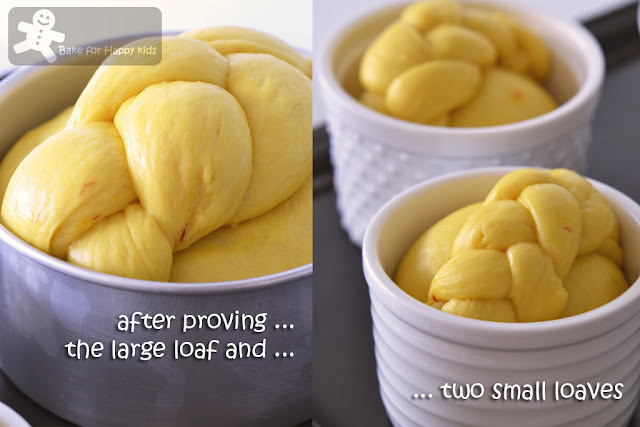 Using 1/2 of the recipe, I have shaped 2/3 of my dough to bake a large loaf using a 14cm round baking tin and 1/3 of my dough to bake two small loaves using two ramekins (each with 1 cup capacity). Put oven rack in middle position and preheat oven to 350°F (or 160°C fan forced). Lightly beat remaining egg and a large pinch of salt (mine is 1/2 egg yolk with 2 tbsp of milk plus salt), then brush egg over top of each loaf. Bake loaves until golden brown and bread sounds hollow when tapped on bottom, about 1 hr. Note: My large 14 cm round bread took 15 mins to bake without foil, then another 25 mins to bake without foil and at last another 5 mins to bake without foil for its most ideal golden colour. Its total baking time is 45 mins. My two small loaves took 15 mins to bake without foil, then another 10 mins to bake without foil and at last another 5 mins to bake without foil for its most ideal golden colour. Their total baking time is 30 mins. Turn loaves out onto a rack, then turn right side up and cool completely. Great looking bread! I'm looking forward to spring (which is what Easter brings in my part of the world). Have a nice break, and Happy Easter. What a gorgeous Easter Bread! I bet it's delicious! Happy Easter! This is a really pretty loaf! Have a great holiday! Zoe this looks great... It looks so soft and fully!! We are going to try to recreate this this weekend! Happy Easter!!! Nice bread, looks so soft and yummy! Your bread looks really soft, and how luxurious with a touch of saffron. Never think of using saffron in bread. Well I can make good used of my saffron which I bought so long ago. Love the braid on top of loaf. Very pretty! Looks good!! Will bookmark n try soon!! But where to buy Saffron? You can find saffron in the spice section in most Australian supermarkets. Not too sure if you can yours at your nearest local supermarket. Zoe, Russian Easter Bread looks good and I am sure it tastes heavenly good. How I wish I can spend my Easter at your house. Zoe, the shape of this bread is beautiful. Happy Easter day!!!! Zoe , I haven't even made some of the CNY recipes that I bookmarked and now it's nearly April :P :D Your Easter bread looks pretty delicious ! The saffron surely adds a wonderful color to the bread . Happy Easter and have a great time with your family !!! Adding saffron must have added great flavor and an amazing aroma! This bread looks gorgeous. I also can't believe Easter is coming so soon! What a beautiful loaf of bread! No doubt, your family will enjoy it :) Happy Easter, Zoe!! This looks absolutely delicious! I am now inspired to make some bread over Easter! A beautiful loaf of bread! Saffron is so expensive, I'm saving mine for some briyani, hopefully soon! Haha! Enjoy your break, Happy Easter to you and your family! That is delicious bread Zoe, Love that saffron flavor, it gives color and aroma. Realmente lindo y delicioso un pan que preparaba mi abuela aromático e irresistible me encanta...Feliz Pascua...hugs,hugs. Oh yes, priceless indeed! They look so pretty and soft! Happy Easter to you and your family. Your Easter bread sounds so delightful. Especially when I'm bread-free right now. No, your bread is not plain looking at all, nice golden hue and neatly braided. Love any food with saffron. Enjoy the weekend and happy Easter. I don't celebrate Easter but I'm enjoying all the recipes posted. Good one, Zoe! Awww what a beautiful Russian Easter Bread :D I really like it. It's simply delicious ! I must try it ! Happy Easter. You share such interesting recipes...absolutely loving that pretty braid on the super sift bread and the use of saffron..amazing!! Love how that little touch of saffron transforms the bread into a golden loaf. Gorgeous! Plaiting is also WOAH. I'm a mess when it comes to baking, so doubt I'll ever do somethign of that standard, but very inspirational all the same! Hi Zoe! Happy Easter and you have a wonderful weekend! Have a happy Easter! Those bread are just divine! 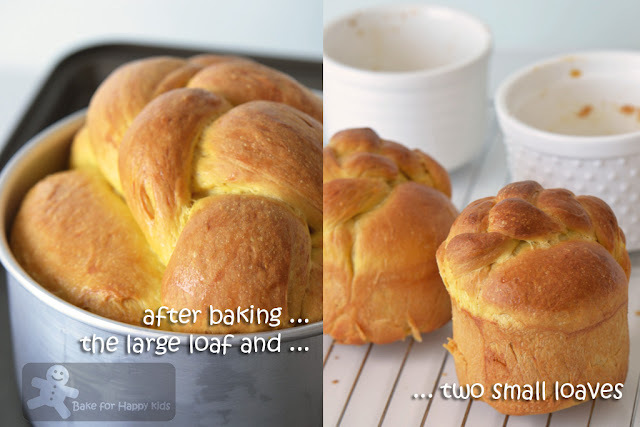 Hi Zoe, lovely looking braided bread, love the color very much and I still have some saffron in my fridge:D Happy Easter to you! Nice! It's like Challah. Yum! This looks fantastic! 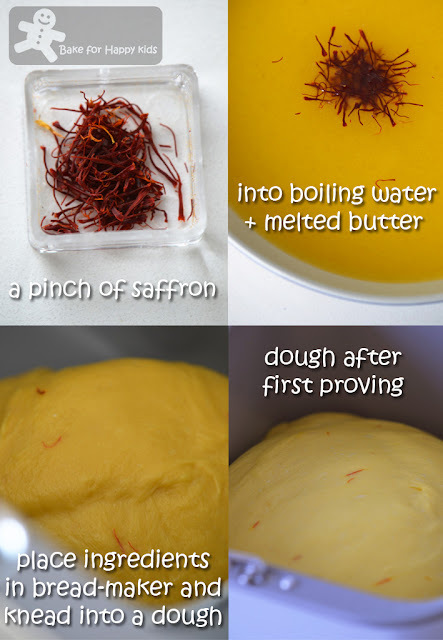 I've never heard of putting saffron into bread before but it's worth trying. Lucky me, I have this expensive ingredient at home. I think your blog is so cute and photos are awesome. i think i saw a kulich recipe in one of the williams sonoma's books. I've actually mistaken it as kugelhopf..now that you said it's an russian bread. That's a pretty loaf! have a great holiday! The bread looks very soft indeed and beautifully made! 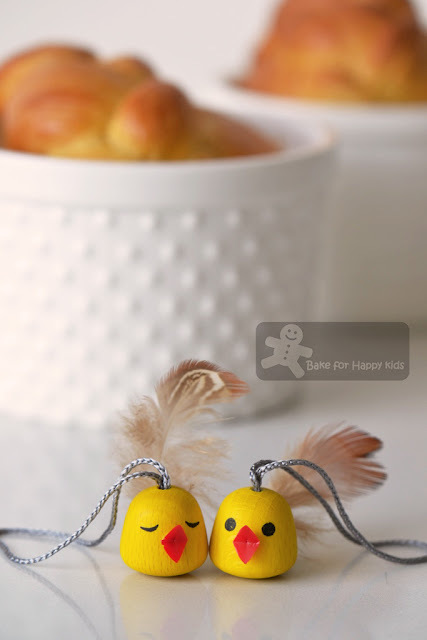 Those little chicks are adorable too :) hope you had a great Easter! Beautiful swwet breads Zoe! Have a great time at your vacations! Your loaves are beautiful. Such gorgeous texture of the bread. Wow you did a fabulous job on this bread!! Zoe, I love the shape of the bread and the lovely yellow colour. It does look like a delicious bread that can be eaten plain. Zoe, I love the color of the bread, looks so sunshine lol. I love the saffron threads in this bread...great flavor and color Zoe...yum! 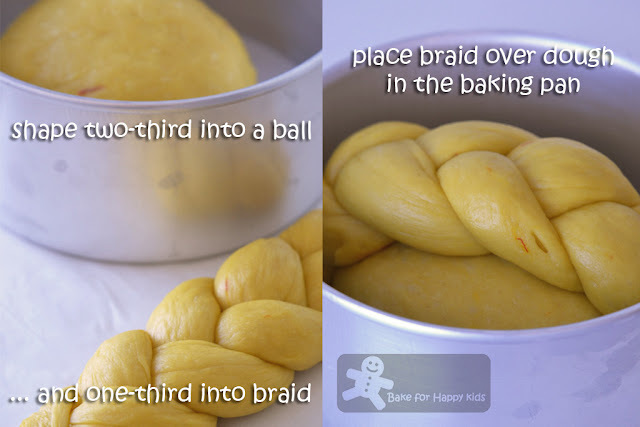 Love the colour of the bread, and you've braided it perfectly too! Looks so soft! beautiful and plump loaf. Love few slices with a cuppa, Zoe. Great looking loaf. I'm sure it tasted fantastic. Happy belated Easter!